Want that golden bronzed look instantly? Spray tanning might be right for you. SunsUp Tanning Centers offer the best in UV-Free Spray systems. We only use premium spray solutions that are designed to work flawlessly with our systems. There are many companies out there offering similar products, but we only carry the REAL THING! The Mercedes of UV-Free spray tanning booths, this baby does it all. 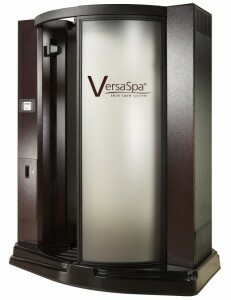 SunsUp is the first company to offer the VersaSpa to its clients. With 39 tanning options, the Versa provides ANY level of tone you seek. The 40 second process will have you tan in no time……it even dries you off! There is nothing else out there like it, come in and give it a try, it’s a completely unique experience. 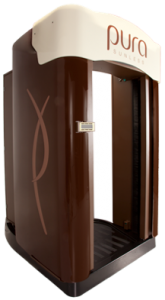 Our newest addition to our sunless spray tanning option at SunsUp is the Pura Sunless System. This advanced spray booth offers amazing results and coverage like out other options but with a few additional comforts its quickly becoming a favorite with users. Trinity Mist: Three spray heads positioned so that the spray from each nozzle does not collide with the other sprays, delivering solution evenly to the skin. Heated Air: The Pura heated air handling system ensures the heat stays with you through the dry process. Four Minute Tan: Front and back prep, front and back spray… and done! Simple, fast, effective! Available at select locations, contact us to find one near you!